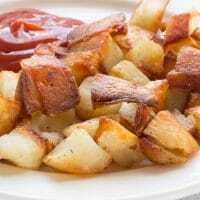 Fried potatoes, AKA home fries, are classic southern comfort food and can be served at any meal. These potatoes are versatile, pairing well with many foods. 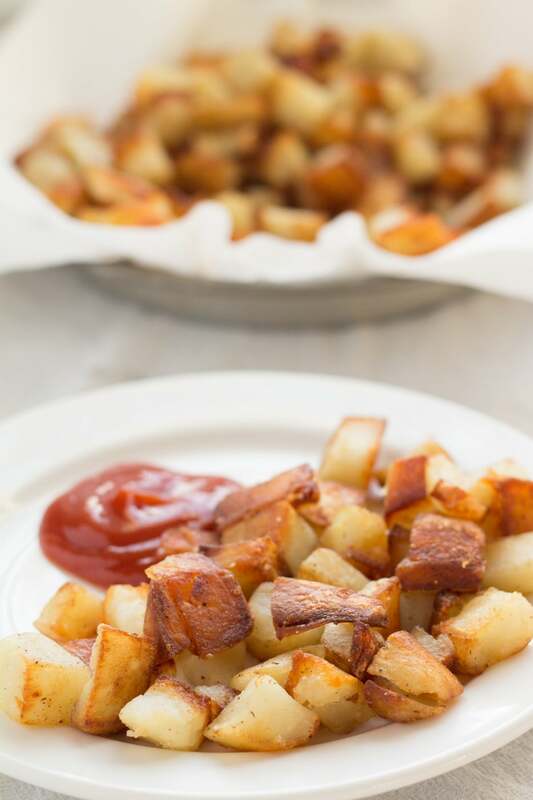 Any potato can be used for fried potatoes (AKA home fries). I have the best results when I use Russet potatoes. Russet potatoes are those dirty looking and dusty feeling potatoes. I can be lazy and hate peeling potatoes so my absolute favorite potatoes are jumbo baking potatoes. I can get away with peeling fewer potatoes. There is also less wasted per pound with these potatoes. Fried potatoes can be made with the skin left on if using thin-skinned potatoes like red or yellow but may separate from the potato as they cook. I don’t like the texture of fried potato skins in this dish. I would not leave Russet potato skin on, they are kind of thick. 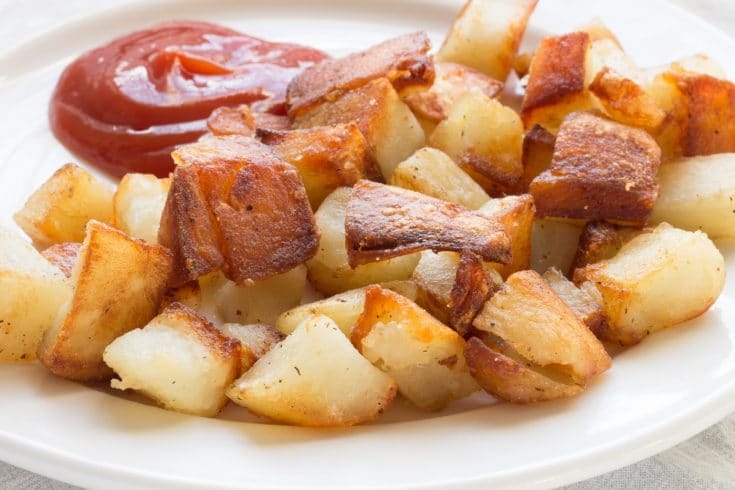 Sliced potatoes can be used and they will be more like cottage fries. I think that sliced potatoes fall apart too easily when pan frying. I think it happens because the potatoes cook all the way through before having a chance to form a crispy skin. Slice the potatoes fairly thick is using slices. I prefer diced potatoes for home fries. I choose the size of my potato dices depending on which meal they are going with. The smaller the dice the quicker they will cook. When I want super crispy potatoes like with breakfast I dice them small. Maybe 1/2-inch or smaller. For dinner meals like salmon patties or fried pork chops, I use a 1-inch dice. A larger dice offers crispy outsides with a fluffy middle. CAN I MAKE FRIED POTATOES WITH RAW POTATOES? YEP! I always start my fried potatoes with raw potatoes. The only preparation my potatoes get is peeling and dicing. As I dice the potatoes I add them to a large bowl of water just to prevent browning. DO I NEED TO SOAK MY POTATOES? No. I do not soak my potatoes in salt water or even for a certain amount of time. I soak them as long as it takes to get all of the potatoes ready. Sometimes my potatoes sit in a bowl of water for several hours, only because I prepared them sooner than I needed them. A cast iron skillet is the most used pan in the south. I have never had a whole lot of luck. My potatoes always stick to the bottom. My preferred pan is my trusty electric skillet. 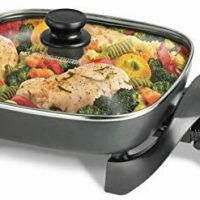 It’s non-stick and I can control the heat so much better. The sides are high enough to keep from diced potatoes from jumping over the edge. But the real reason I use it is that I get crispier potatoes. If using a skillet on the stove make sure it is a non-stick skillet. WHAT KIND OF FAT SHOULD I FRY POTATOES IN? 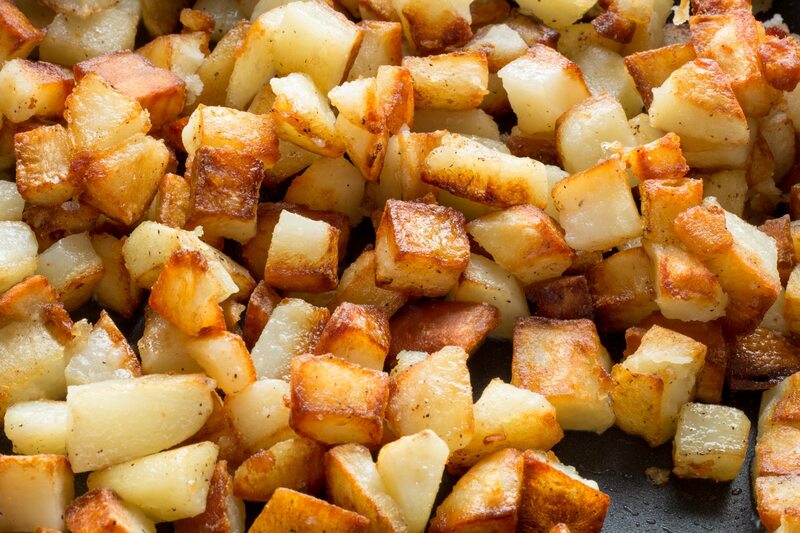 I fry my potatoes in vegetable oil or vegetable shortening. Lard is also an acceptable fat for frying potatoes in. I know some people use butter and it can be added for some flavor. When adding butter wait and add it after the potatoes have gotten some color on them and formed a crust. 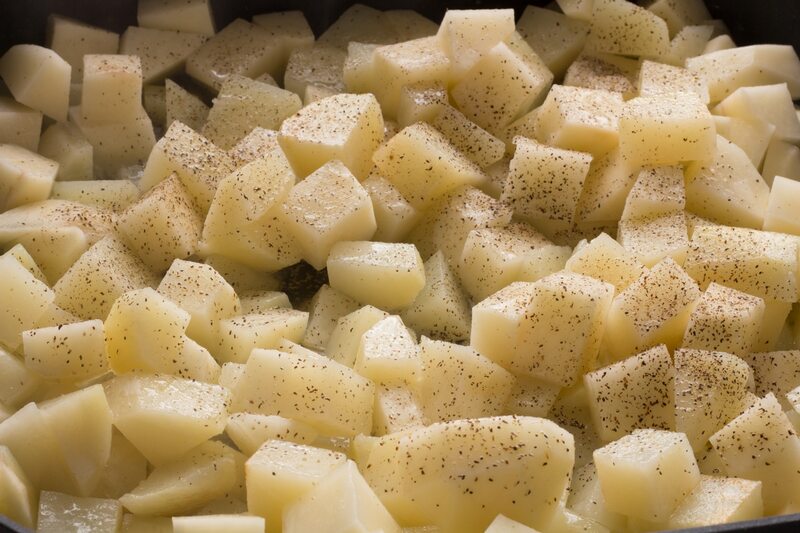 The water content in butter will begin to steam the outside of the potatoes if added too soon. Another great way to add some added flavor is to add some bacon grease to the oil or shortening. Bacon grease can be added sooner than the butter because it should have little to no water in it and it has a high smoking point like the oil. Diced bell peppers and onions can be added to your fried potatoes. I call these potatoes O’Brien though. I make this version as breakfast potatoes. They go perfectly with omelets and our meal-prep egg bagel sandwiches. I would add the peppers and onions when the potatoes are close to being cooked. Peppers and onions will cook faster than the potatoes and will burn if added too soon. Use plenty of oil. The amount of oil absorbs in fried potatoes has nothing to do with the amount of oil used. It’s the temperature of the oil that affects it. Use a higher heat in the beginning to get a crust formed on the potatoes before they have a chance to cook and fall apart. A crust will keep the potatoes from sticking to each other and the pan. DO NOT place a lid on the potatoes. Using a lid will steam the potatoes before they have a chance to crust and the potatoes will start to fall apart. If you are looking for fried mashed potatoes, just go on and make some fried mashed potato balls instead. Stir and coat the potatoes with oil before starting the frying process. This will help keep the potatoes from sticking together. Garden Fresh Tomato Slices, to some folks in the south, fried potatoes with fresh tomatoes is a complete meal! Who are we kidding? 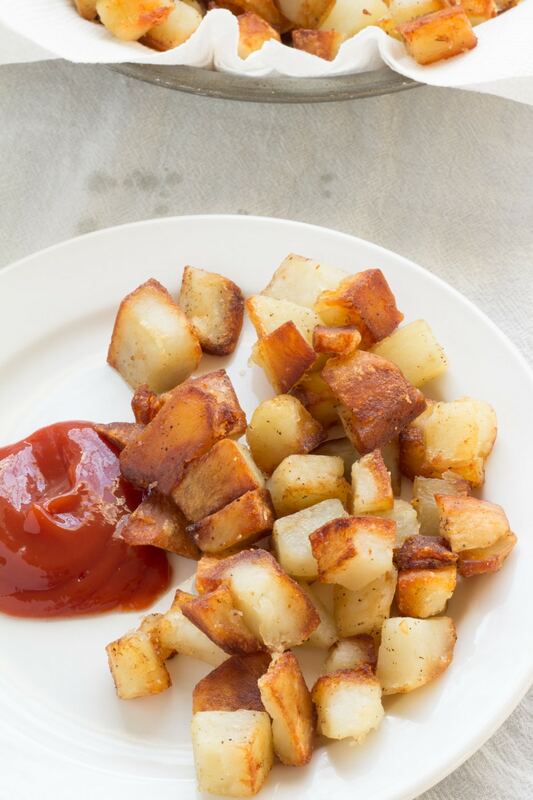 Fried potatoes go with just about anything! Add the oil to a skillet and heat to 350⁰F. Add the diced potatoes and stir to coat with oil. Sprinkle salt and pepper over the potatoes and stir again to distribute. Allow potatoes to cook until the bottoms begin to lightly brown. Gently stir the potatoes moving the bottom potatoes to the top. Continue cooking, stirring occasionally until the potatoes are cooked as desired. The longer the potatoes cook, the darker and crispier they be. Frequent stirring will cause the potatoes to fall apart and turn into mush. Any potato can be used, but Russet, or baking, potatoes will produce the best results. Rendered bacon fat can be added for more flavor if desired. These potatoes look incredible! So perfectly golden and crisp. Great tips on how to make them!